Show your pro•fes•sion•al pride! Academy participants everywhere are the definition of professional in these comfortable and sturdy 100-percent cotton t-shirts. 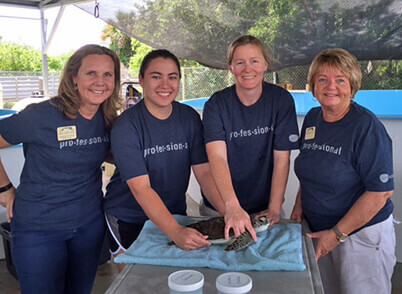 The San Diego Zoo Global Academy t-shirt is a way for you, or your institution, to share your commitment to learning and professional training. The shirts have been popular with Academy participants, and can be an excellent addition to your career development program, as an incentive, and for team building. 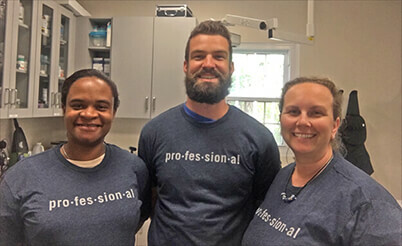 Brevard Zoo's eLearning team wearing their Academy shirts. The husbandry staff at the Bermuda Aquarium Museum and Zoo (BAMZ) shows off their Academy spirit.